Northeast Indiana educator Özlem H. Ersin has been elected to the governing council of the American Public Health Association, the nation’s largest public health organization. 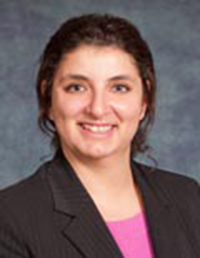 Ersin is assistant chair in the Department of Pharmaceutical Sciences and associate professor of pharmaceutical sciences and public health in the College of Pharmacy at the Manchester University Fort Wayne campus. In addition to teaching, Ersin chairs the Manchester University Institutional Review Board. In 2014, she led the planning committee for the pharmacy college’s inaugural Innovations in Health Care Summit. Ersin serves as scientific advisor on the Indiana Prescription Drug Abuse Prevention Task Force and the Allen County Community Health Improvement Plan for Children. She is an American Association of Colleges of Pharmacy delegate to the Pharmacy e-Health Information Technology Collaborative. In 2013, Ersin played a key leadership role with Parkview and Health Care Excel in obtaining a highly competitive Center for Medicare and Medicaid Services Special Innovations grant for work on improving medication adherence among patients on long-term drug therapies through the use of health informatics. She was recognized in 2011 as an AACP-Walmart Scholar. In addition to earning her doctorate in social and administrative pharmacy from the University of Minnesota, the Fort Wayne resident earned master’s degrees in business administration, adult education, and biological sciences. Learn more about the College of Pharmacy at www.manchester.edu/pharmacy.